Telepixels - Multimedia meets Gadgetry: XBox 360 Launch Part Deux. My prediction is that the early low quantity sale of the XBox 360 was an artificial demand smoke screen to get people to think that they will be sold out for the holidays. Think about this: Microsoft releases a few hundred thousand units early, just dozens of units to thousands of retailers. 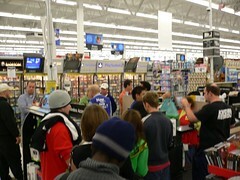 Local news crews show kids lined up in front of stores freezing to get an early XBox. Parents take note and remember Cabbage Patch Kids, Furby's and other holiday "must haves" and figure that they too need to purchase the 360 whenever they can find it! Brilliant! Why else would Microsoft put a product out just BEFORE the largest shopping day in America? The original XBox wasn't exactly a smashing success, so this tactic creates an artificial "want/need" demand because just as in dating, everyone wants what they can't get. Production should not be an issue since they have been making these since the spring. I went to Tokyo 30 days after the launch of the PSP and they were still not available at retail - I had to get mine from a back-ally DVD trader. That contrasts with the spring US launch of 500,000 units sold which were easily obtainable. My local Best Buy had hundreds of units available in stacks with few customers. I even went back the next day to pick up another one. Microsoft has stated that 400,000 360 units were being shipped to the US before Christmas, while these numbers are just shy of the PSP two-day sale quantities, this artificial demand and sales during the "right" selling season should mean that although the XBox will be a sell-out, you will have plenty of units between now and December 25th. I'm headed to Costco to see if I can get one before Black Friday. I bet I will. It saddened me to hear about people that stayed up all night … fought with each other… the highest ebay bid was $10,600. Why? Why are we so stuck on material things? And the more we are told we can’t have something, the more we want to get it. You don’t see anyone lining up at midnight for a furby or tickle-me-elmo anymore. What is it with us humans?